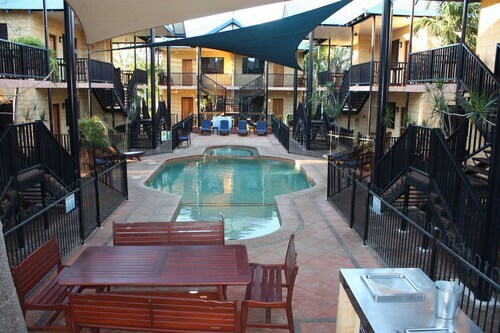 Situated in Broome, this hotel is steps from Pearl Luggers Museum and Johnny Chi Lane. Sun Pictures and Courthouse Markets are also within 10 minutes. Need some Broome accommodation? You’ve come to the right place. Ever since the discovery of the world's largest pearl oyster shell in 1861, Broome has been the pearling capital of Australia. Affectionately known as the 'Pearl of the North', Broome attracted pearl divers from Japan, the Philippines, Indonesia and Malaysia, creating a melting pot of cultures that makes Broome the multicultural town it is today. Only a short flight from Perth, the town’s amazing landscape and colourful lifestyle has also made it a mecca for writers, artists and musicians as well as a popular tourist destination. Once you arrive, take the opportunity to explore Broome’s local industries. Learn about pearls with a trip to Willie Creek Pearl Farm, 38 km north of Broome. Take a tour of the farm and see how pearls are grown and harvested, or just head straight to the gift shop for some sweet souvenirs to take home. 25km from Broome is Roebuck Bay, a beach spot popular with families. It is also the location of the Broome Bird Observatory, Australia's most significant site for shorebirds like the Pied Oystercatcher and Red-capped Plover. Next, head to the Manbana Aquaculture and Discovery Centre where you can learn about the continuing role the local Indigenous people play in the fishing industries. There are heaps of other things to do and see in Broome. Take a trip to Chinatown and see original corrugated iron huts, pearl showrooms and the world’s oldest operating open-air picture garden, Sun Pictures. The famous Courthouse is a quick 20 minute walk away and is known for its distinctive architecture and Saturday morning markets. Those with an appetite will have lots on their plate, with Broome specialising in mangoes, barramundi and – surprise surprise – pearl meat. The thirsty can also try beer from Broome’s local brewery, Matso’s, which occupies a building which started life as Broome's first bank. Take a walk or camel ride along Cable Beach, while staying in our Broome hotels, and discover one of the world's most stunning beaches. Named for the telegraph cable which was laid between Broome and Java in 1889, Cable Beach has 24kms of white sands and turquoise waters. Come here in the afternoon and soak your toes in the Indian Ocean while watching the sunset. The next day, visit Gantheaume Point while the tide is low to see dinosaur footprints over 120 million years old. Our range of hotels in Broome are also a great starting point for exploring the Kimberley region, or if you’d like to be closer, stay in our Kimberley accommodation. Broome is also home to a number of amazing events, such as the famous 'Staircase to the Moon’. This natural phenomenon occurs between March and October for three days after the full moon at extreme low tide. As the moon rises, its reflection stretches over the mudflats of Rosebuck Bay, creating an illusion of a long, silver staircase. Broome also lives up to its reputation as the pearling capital with the Shinju Matsuri Festival of the Pearl in September. Held over 10 days, the festival celebrates Broome’s culture with a range of family-friendly events and entertainment. Lovers of art and nature should also be sure to check out the Opera Under the Stars, held at the end of August each year. Whatever you decide to do in Broome, we’re sure you’ll have a ball! Check out our great range of Broome accommodation and cheap flights to Broome. Need insider tips on must-see attractions in Broome? Check out our Broome travel guide! 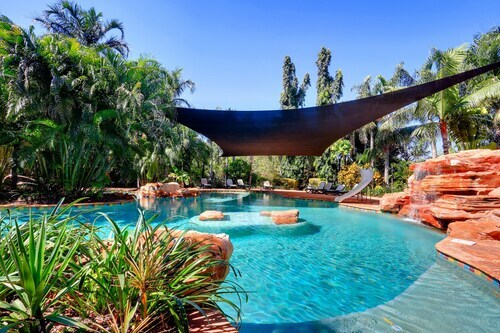 How Much is a Hotel Room in Broome? 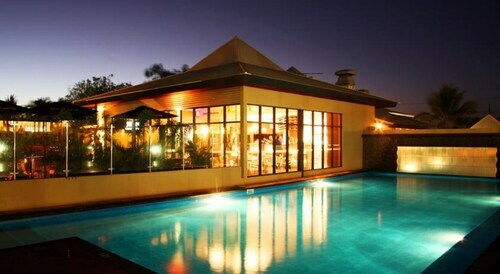 Hotels in Broome start at AU$57 per night. Prices and availability subject to change. Additional terms may apply. The owners were very receptive and responded to communications quickly. The Apartment was pleasingly set out and had every thing that we needed. It is located within easy walking distance to surrounding eateries and the beach. The bus stops outside the entrance to the resort.